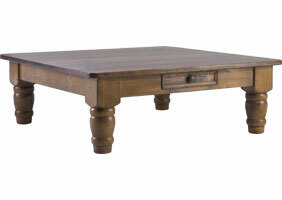 The 48" Square Coffee Table combines a solid wood top with large turned legs into one timeless piece. The table is 4 feet square, has 6-inch turned legs and one storage drawer. The legs are turned from a solid block of wood and have a thick and heavy look. The drawer has a mitered raised molding and runs on wood runners for ease of use, the knob is wood. Bring the feel of a grand, five-star, rustic lodge into your home. 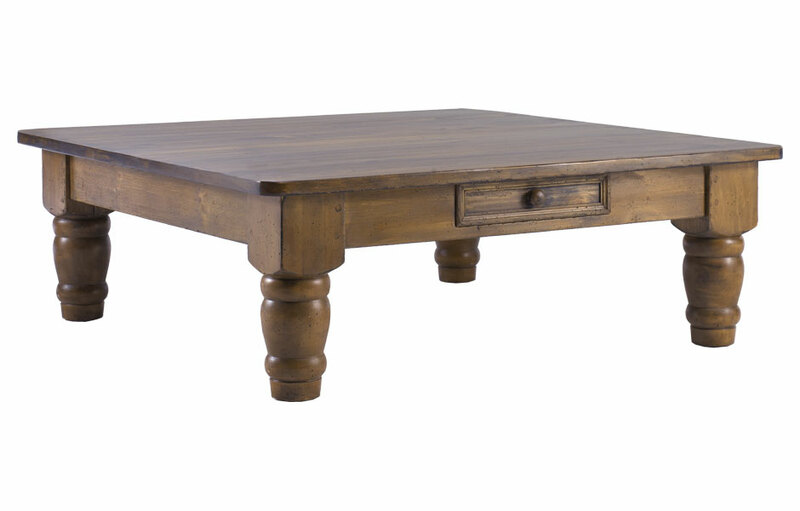 The 48" Lodge Square Coffee Table combines a solid wood top with large turned legs into one timeless piece. Enjoy gathering with friends and family around this large 4ft. square cocktail table to play board games, lively conversations and snacks during a big game. 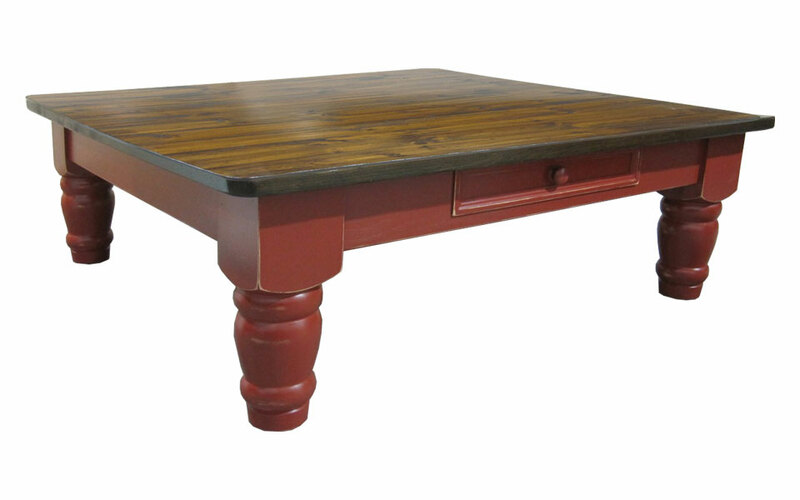 The sturdy, 6" thick hardwood legs add to the grand scale of the table. The beautiful table top showcases the natural grain of the wood. A deep storage drawer stows away all your remotes, tablets and magazines out of sight. 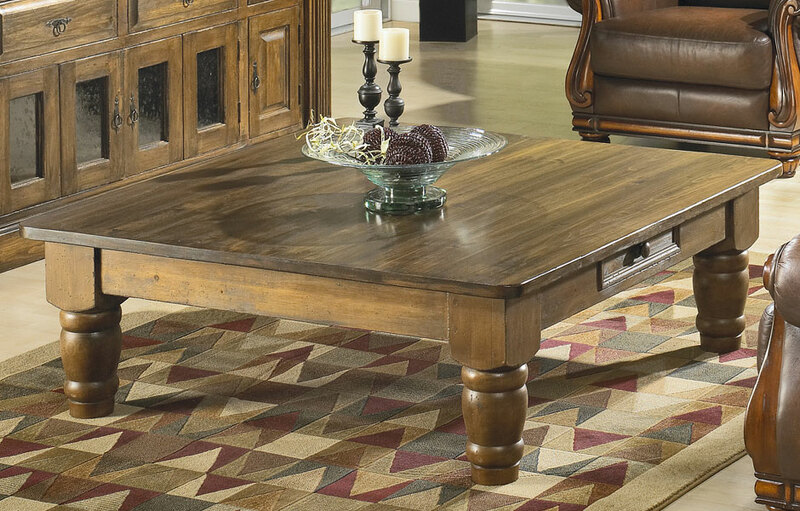 The Lodge Coffee Table will become the centerpiece of any great room. The entire coffee table is made of solid wood. The table legs have mortise and tenon joinery for enduring strength and durability. The center drawer has bevel molding details and a classic wood knob. The drawer slides effortlessly on wooden glides for years of use. All tops are water-sealed to prevent water rings, and for daily use. The 18.5" high table is a comfortable height to access the tabletop while sitting on a sofa or chair. The square low table can be painted in a classic two-tone finish—a stained top and painted base, or all-over one color finish. The rustic Lodge Coffee Table complements French Country, English Cottage, Farmhouse, Rustic, Transitional and Traditional style decors. 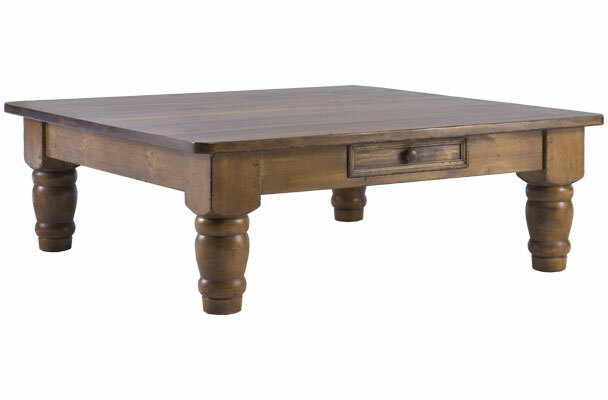 48" Square Coffee Table with 6" legs, 48" wide, with one drawer finished in caramel stain.